There is a growing demand to make indoor environments as healthy and “green-friendly” as possible. Choosing the right materials is a critical step. To assist in the process, CRI has created Green Label Plus for carpet, adhesives, and cushion to raise the bar on lowering emissions. Green Label Plus is a voluntary, industry testing program for carpet, adhesive and cushion products that establish the highest standard for indoor air quality (IAQ) ever set by the carpet industry. 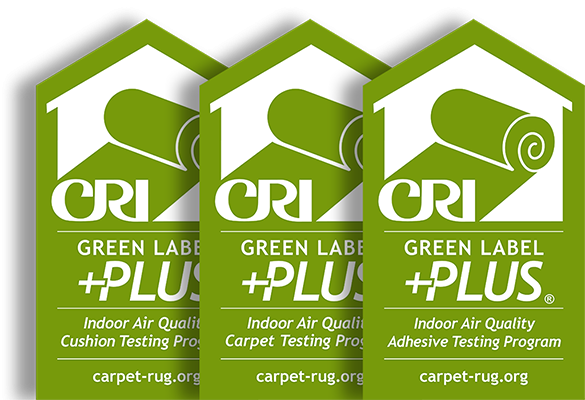 The Carpet and Rug Institute (CRI) created Green Label Plus to identify carpets, adhesives, and cushions that are tested by an independent, certified laboratory and meet stringent criteria for low chemical emissions. It ensures customers they are purchasing the lowest emitting carpet, adhesive and cushion products on the market. It is designed for architects, builders, specifiers and facility managers who want assurance that carpet, adhesive and cushion products meet the most stringent criteria for low chemical emissions. Green Label Plus meets, and even exceeds, California’s indoor quality standards for low-emitting products used in commercial settings such as schools and office buildings. The carpet industry took the initiative to enhance its GreenLabel program for carpet, adhesives and cushion to meet testing protocols used by the Collaborative for HighPerformance Schools (CHPS). Under the agreement between CRI and the California agencies, Green Label Plus is acceptable for the CHPS low-emitting materials criteria for use in schools. The manufacturer voluntarily participates in the program and is committed to developing ways to minimize any adverse effects on indoor air quality. The product is also recognized by the US Green Building Council’s LEED version 4 standard as a Low-Emitting Materials Third Party Certification and can contribute one point to a building’s LEED score. To receive Green Label Plus certification, carpet, adhesive and cushion products must undergo a rigorous testing process. Emissions are measured for a range of chemicals and testing is administered by an independent laboratory. All testing evaluates carpet against the 35 compounds listed on the California 01350 version 1.1, except for Caprolactam. Each product category also includes additional compounds for certification, six for carpet, two for carpet, and seven for adhesive. For acceptance into the GLP program, a product must pass a 14-day test of the full list of 35 compounds, along with its specific category compounds, and the total level of volatile organic compound (TVOC). Annual testing is required for continued compliance within the GLP program. Samples will be evaluated at 24 hours. If the sample does not meet the 24-hour criteria, the test may be extended to 14 days upon approval by the participant. Biennial testing is also required for continued certification under Green Label Plus. Done every second year after the initial test, a test sample is evaluated at 14 days for the full list of compounds and category specific compounds. The Green Label Plus is an example of the Carpet and Rug Institute’s leadership in the best practices of environmental responsibility. American National Standard Institute (ANSI), the premier source for international standardization and conformity assessment, has accredited CRI for testing indoor air quality. Green Label Plus is the first, and only, ANSI-accredited green carpet program in the U.S. An accreditation body is an impartial third party that tests and evaluates a product to determine its compliance with relevant standards. Green Label Plus programs, which test for and certify low emissions from carpet and adhesive, comply with the International Organization for Standardization (ISO) and the International Electrotechnical Commission (IEC) Guide 17065, General Requirements for Bodies Operating Product Certification Programs. ANSI Accreditation is a further assurance that the products tested and certified by CRI are green building products that meet high standards for indoor air quality. Learn more about Green Label Plus and Green Label Plus products at www.carpet-rug.org/GLP.